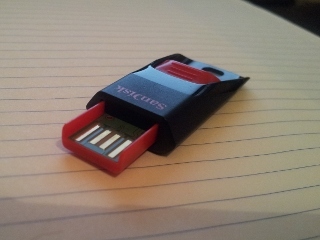 By default, flash drives are formatted with the FAT32 file system. FAT32 has a file size limit of about 4.3GB. To get around this, you can format with a file system that supports bigger files. I chose ext4 for this, you can use ext2, ext3, or others. Who's a big boy today? Performance of flash drives under different file systems can apparently vary markedly. I didn't have any issues with mine using ext4. Use df to find out which device is your flash drive, in my case it was /dev/sdd1. (Make sure you get this right, so you don't blat your hard drive or something). The program 'mkfs.ntfs' is currently not installed. But it says it's already installed. This is a known bug, a simple workaround is to just run mkntfs rather than mkfs.ntfs.